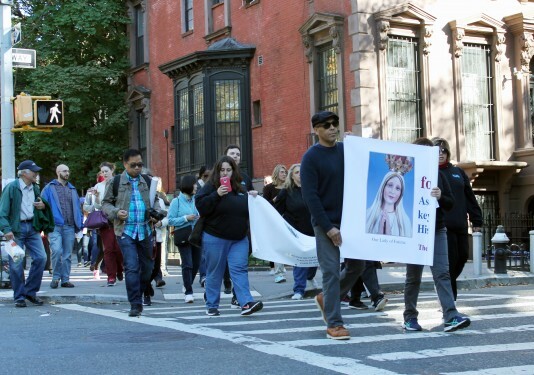 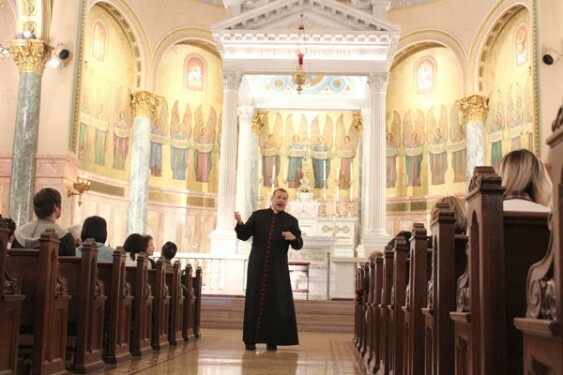 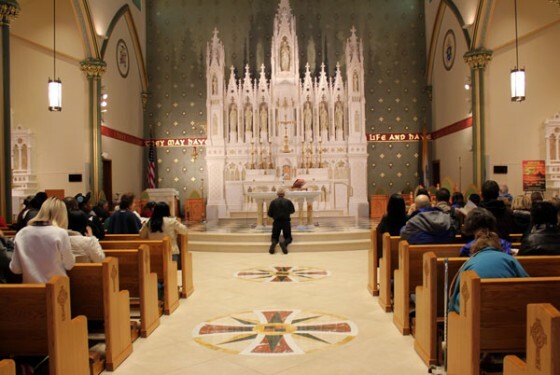 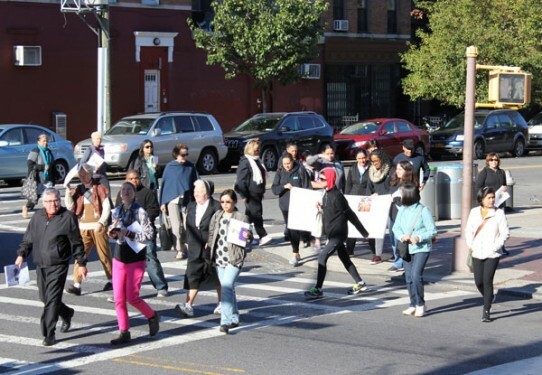 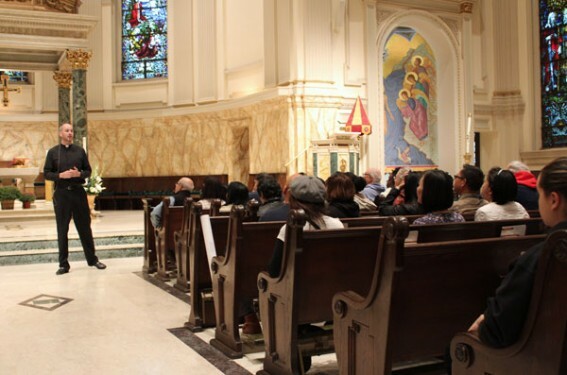 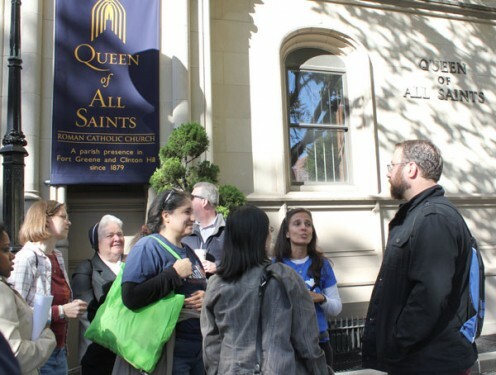 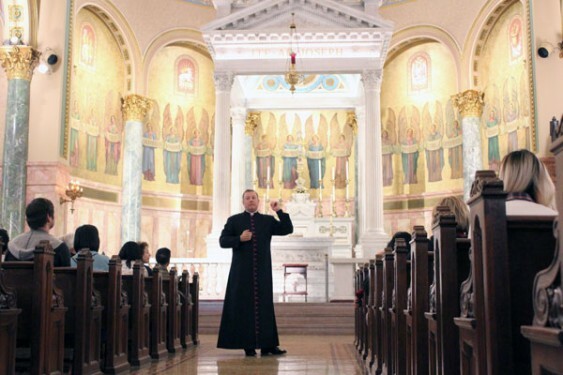 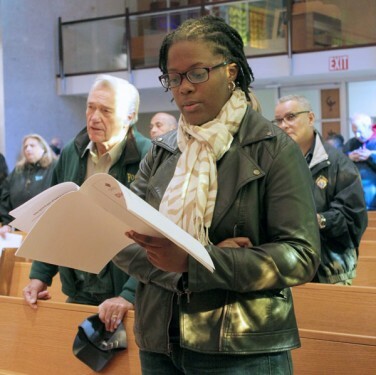 Two Holy Doors, a noted historian, church and street art and a wedding were among the different and sometimes unexpected ways Catholics experienced faith and fellowship on a walking pilgrimage of eight Brooklyn worship sites, Oct. 15. 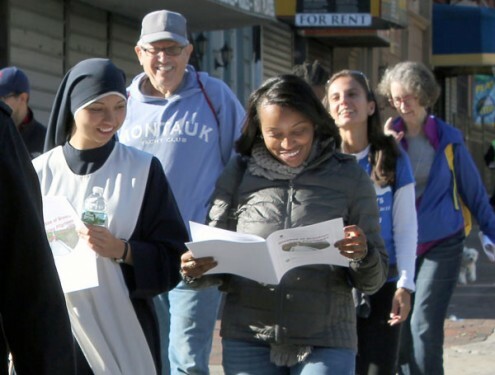 Coordinated by the diocesan School of Evangelization, this walking pilgrimage was planned as a Year of Mercy event aimed at young adults. 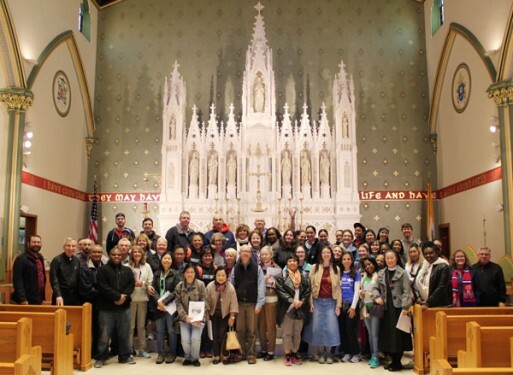 But what materialized, however, was an intergenerational group of over 100 registered pilgrims from the diocese and the tri-state area. 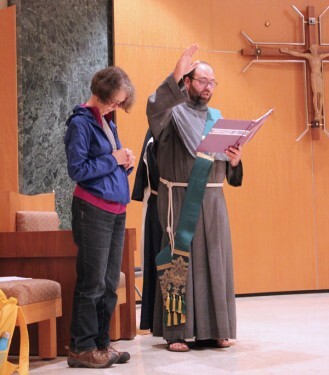 And that was just fine by Paul Morisi, the diocese’s young adult faith formation coordinator, and pilgrimage organizer. 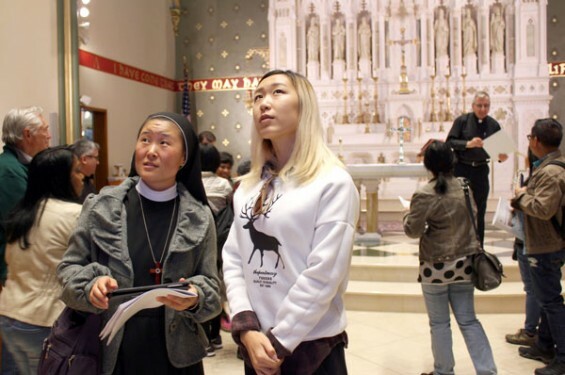 Sarah Papsun, left, admires the ceiling of St. Joseph Co-Cathedral with a fellow pilgrim. 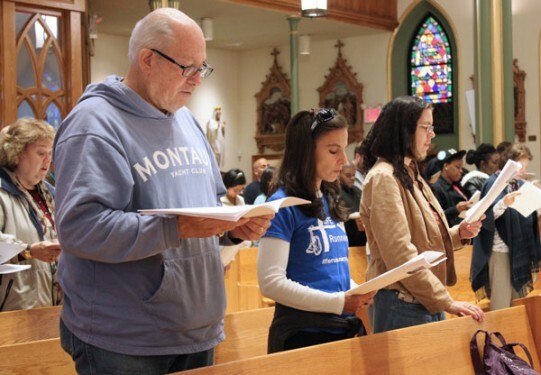 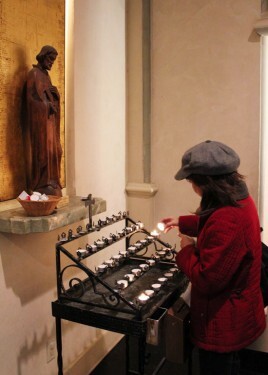 The idea for the pilgrimage came from Morisi’s colleagues in the young adult ministry office of the New York Archdiocese. 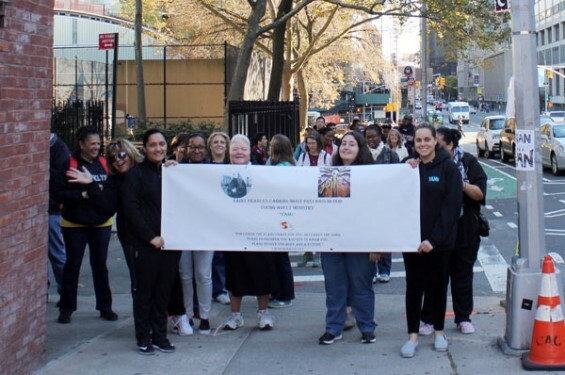 They’ve conducted an annual walking pilgrimage in the city for the last few years and seen the participation rate grow from about 50 people to 500. 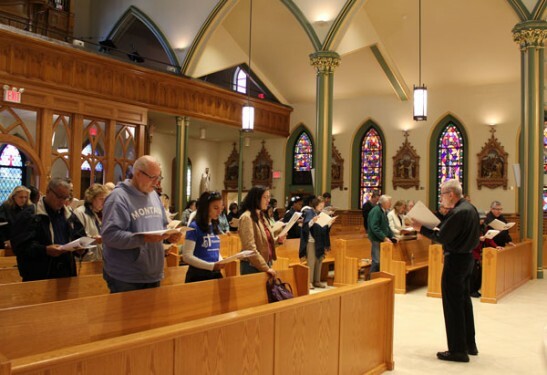 “They had come to me and said this is a nice way to get young adults and those who support young adult ministry to not only gather for fellowship, but also learn about their faith and have an opportunity to pray,” Morisi said. 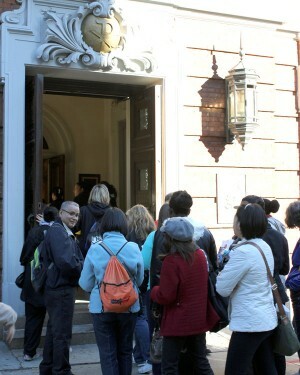 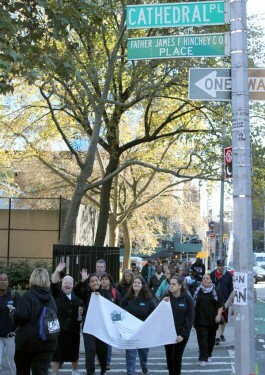 Pilgrims began their journey at 9 a.m. from the chapel of the diocesan offices in Park Slope. 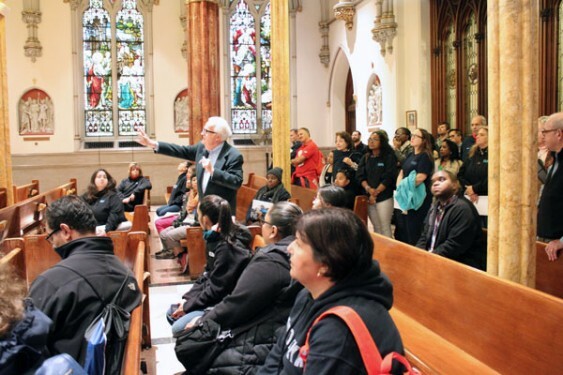 After a welcome from Ted Musco, executive director, diocesan School of Evangelization, a brief prayer service was held with Sisters Celia Deutsch, N.D.S., and Tatiana Ramirez, P.C.M. 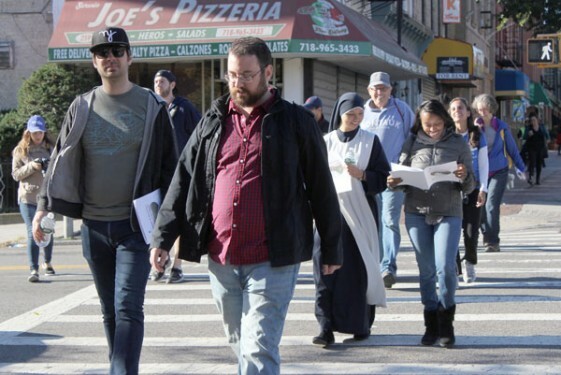 Friar Nicholas Spano, O.F.M. 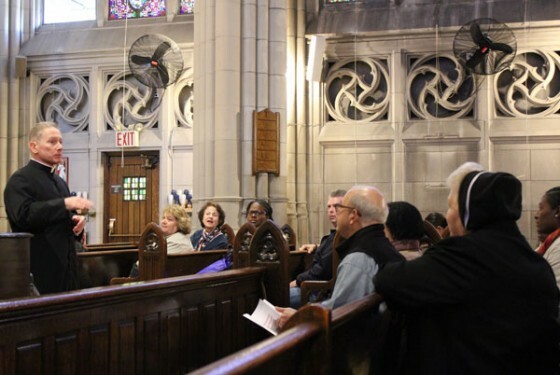 Conv., of the San Damiano Mission in Greenpoint/ Williamsburg, prayed over the pilgrims and sprinkled holy water on their heads, asking God to bless and guide them. 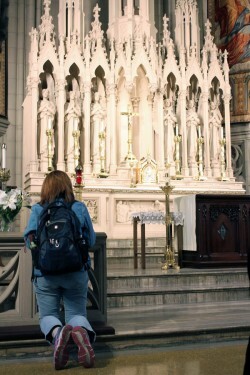 Travelers then went by foot to seven churches: Holy Name of Jesus, St. Francis Xavier and St. Augustine, all Park Slope; St. Joseph Co-Cathedral in Prospect Heights; Queen of All Saints in Fort Greene; and the Oratory Church of St. Boniface and St. James Cathedral-Basilica, both Downtown Brooklyn. 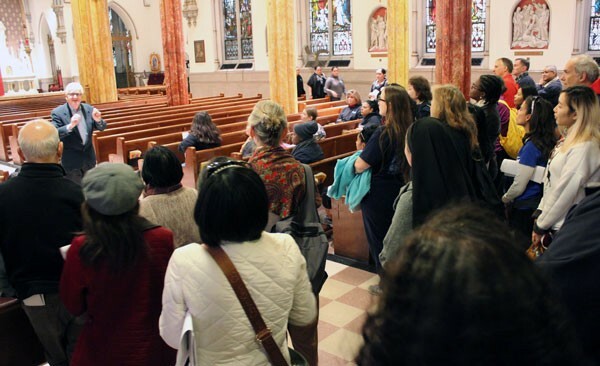 At each site, the group learned about the church’s art, architecture and history, usually from parish priests. 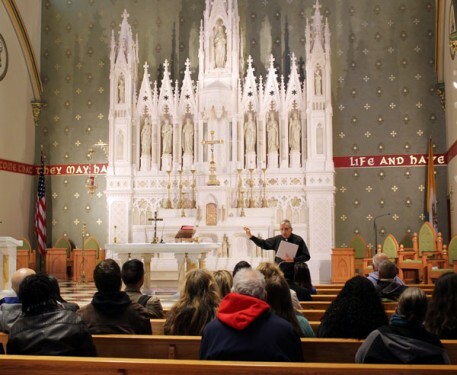 At St. Francis Xavier, the talk and tour was provided by art historian, Dr. Francis Greene, a professor at St. Francis College, Brooklyn Heights. 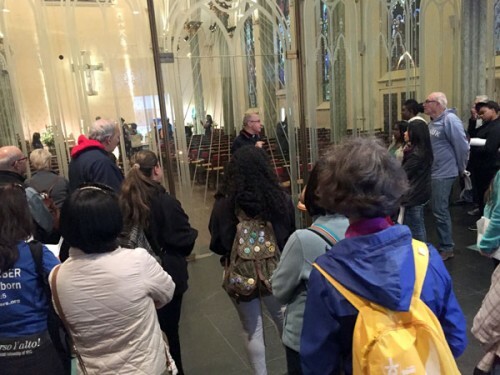 The five-mile footpath was mapped around the Holy Doors at the co-cathedral and cathedral-basilica, Morisi said. 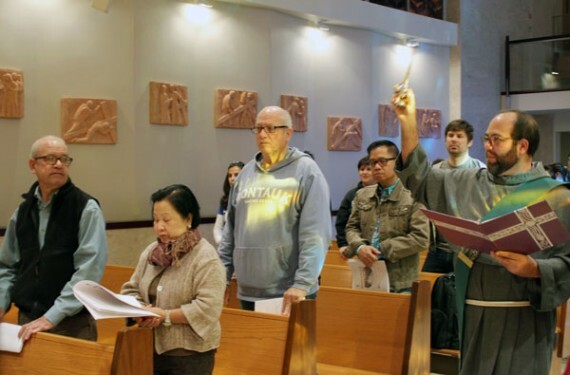 Opportunities were available to meet the conditions for a Year of Mercy indulgence, which include passing through a Holy Door, attending confession, praying for the pope’s intentions and receiving the Eucharist. 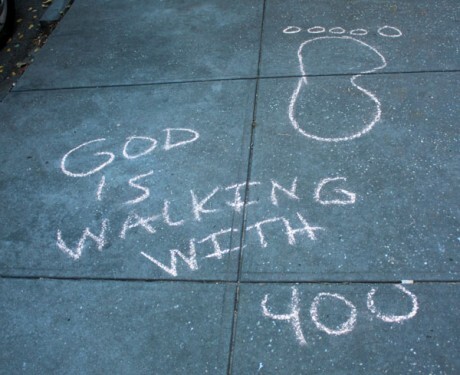 But the doors weren’t the only factor in charting the course. 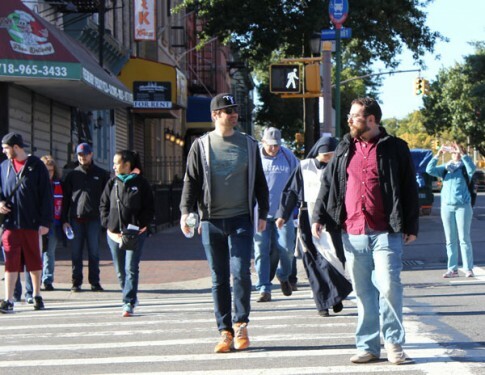 “We wanted to work our way through Park Slope, over into Fort Greene and then Downtown Brooklyn,” which are areas, Morisi noted, that have growing populations of young adults. 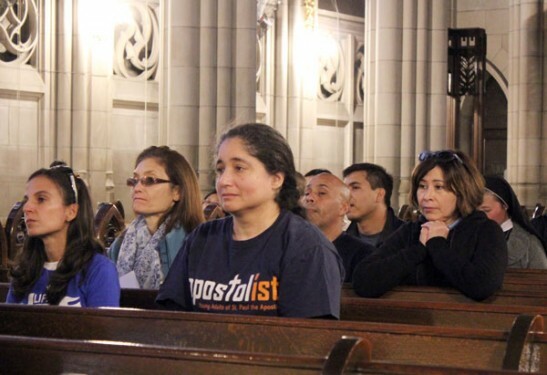 “The hope is that we can be a witness to them, and they can see the Church is relevant, the faith is relevant, Christ is relevant,” he said. 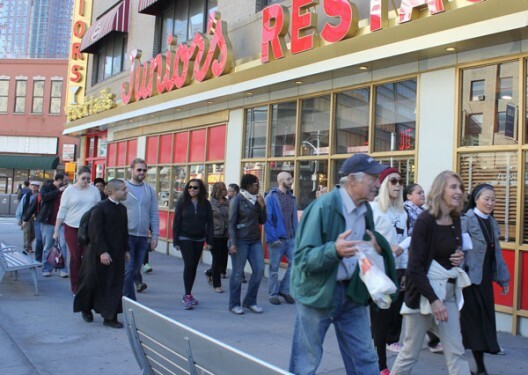 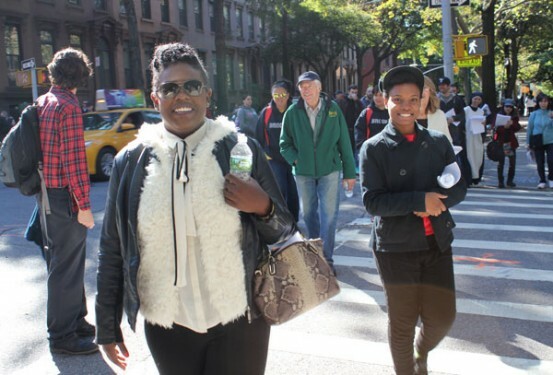 Sharing sidewalks with residents going about their Saturday routines, travelers got to know each other as they took in the sights, including public murals along Dean Street and the glossy exterior of Junior’s Restaurant on Flatbush Ave. Extension. 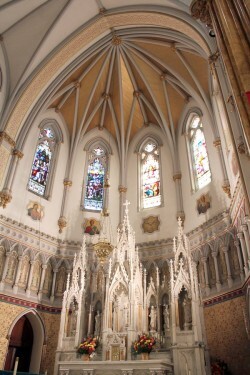 A highlight was clapping for newlyweds exiting St. Boniface Church for the first time as husband and wife. 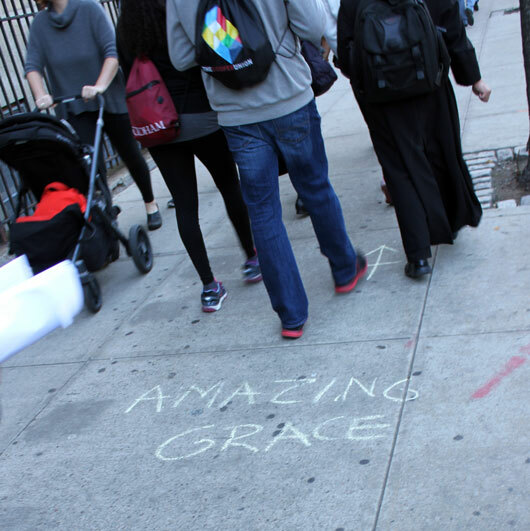 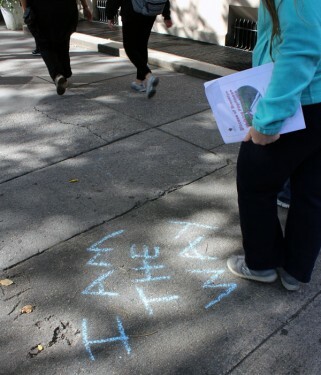 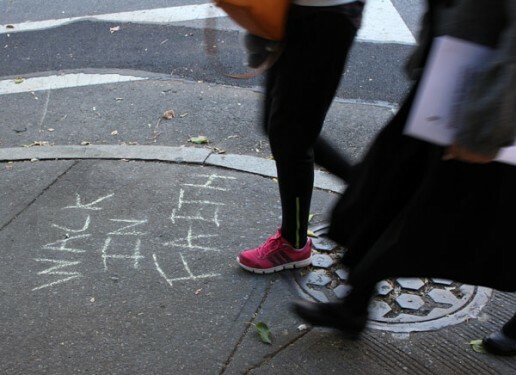 Messages of mercy, inspiration and prayer written in colored chalk by Ken Wodzanowski, director of the Bensonhurst Cluster Youth Ministry Office, guided the group along the trail, much like the signs that mark the pilgrims’ route on the Santiago de Compostela in Spain. 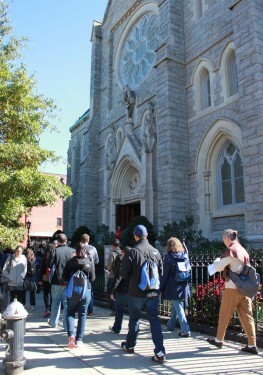 The path ultimately led the faithful to close the day by sharing 5 p.m. Mass with parishioners of the cathedral-basilica. 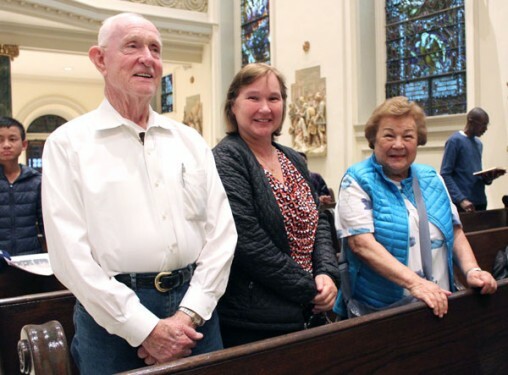 While a core group made the trek from start to finish, participation was fluid with people joining and departing at parishes along the way. Alice and Robert Hennessy, and their daughter Kathleen, met the group at both Holy Door sites. 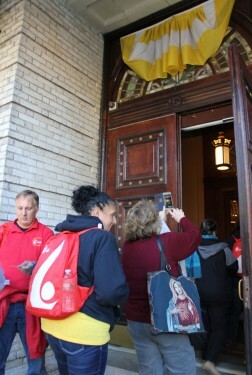 St. Joseph Co-Cathedral and St. James Cathedral-Basilica were their 34th and 35th Holy Doors, respectively. 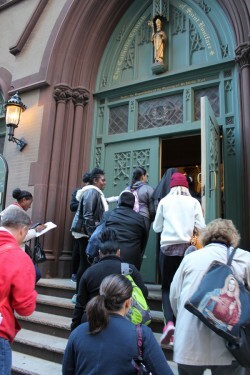 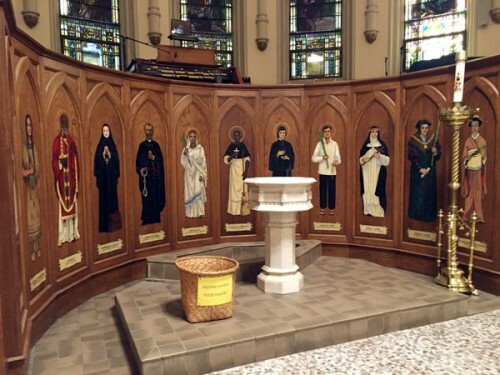 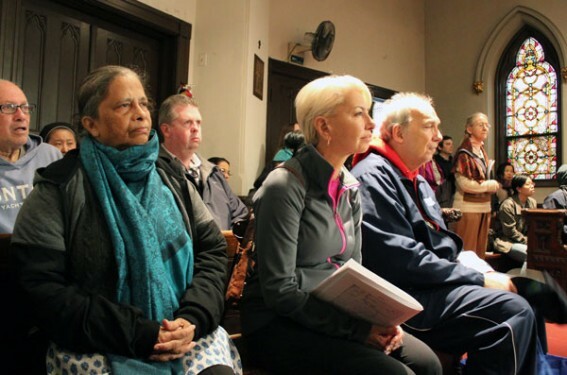 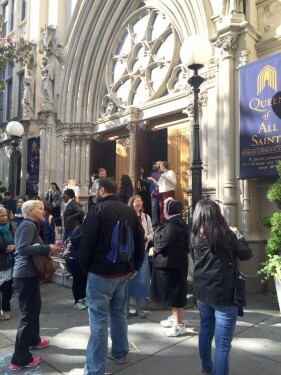 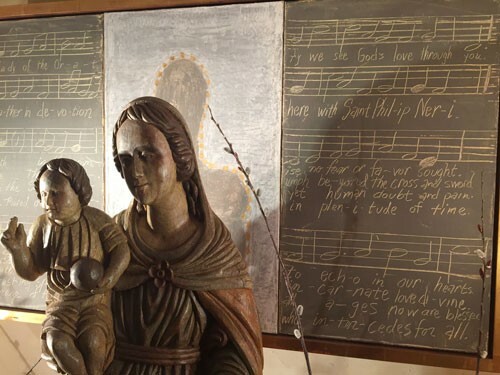 Parishioners of St. Anthony’s Church, Northvale, N.J., they’ve visited designated doors in New Jersey, New Orleans, Quebec, Queens and now Brooklyn. 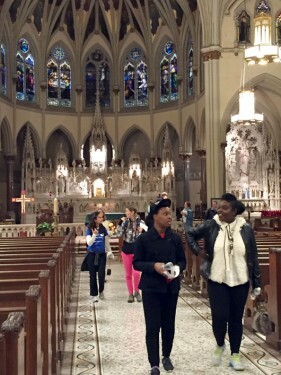 They hope to walk through a few more before the Year of Mercy closes on the Feast of Christ the King, Nov. 20. 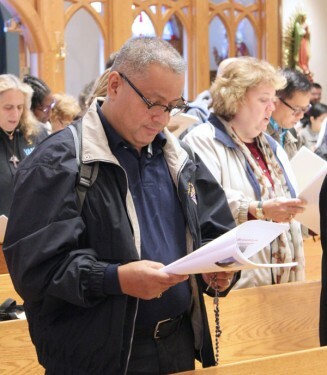 “And be merciful to others as He’s merciful to us,” added Kathleen, a social worker who drives her parents to the designated doors on her days off from work. 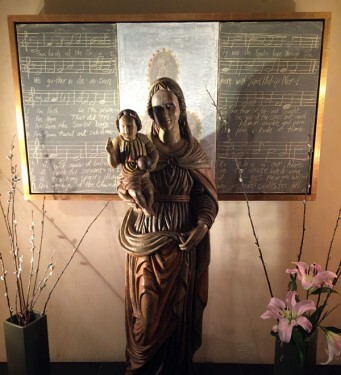 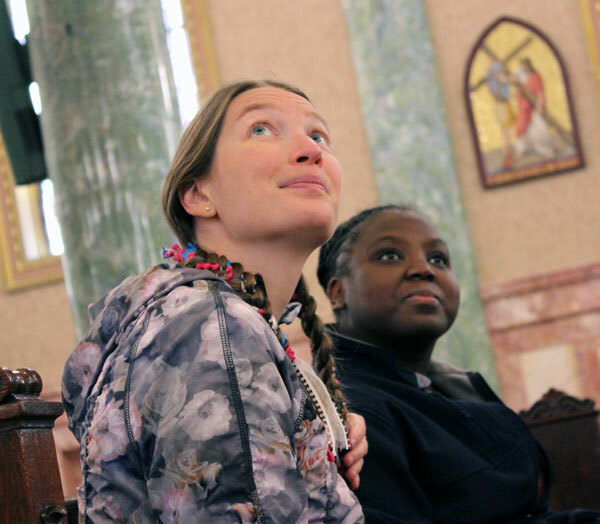 A parishioner of Our Lady of Miracles, she thinks the pilgrimage was an “incredible opportunity” for young adults to get together, and was happy her friend, Keptah Saint Julien, accepted her invitation to attend. Keptah Saint Julien, left, and Desiree Alexander shared faith and met friends on the five-mile trek. 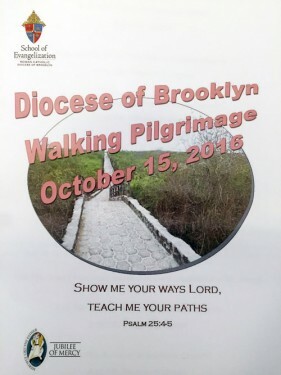 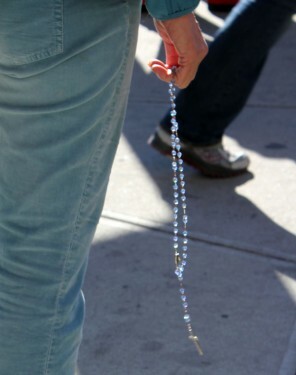 Sarah Papsun of Greenwich, Conn., participates in the New York Archdiocese’s annual walking pilgrimage, and through that mailing list, learned about the Brooklyn event. 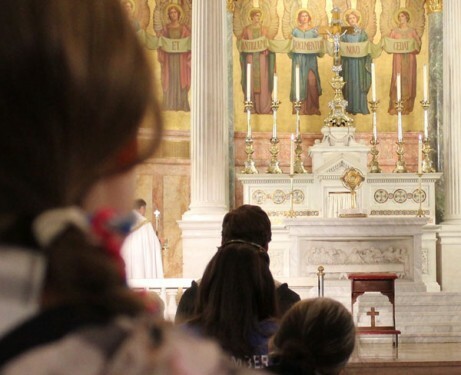 “It’s been a really blessed day,” she said as she prepared to head home after Mass.